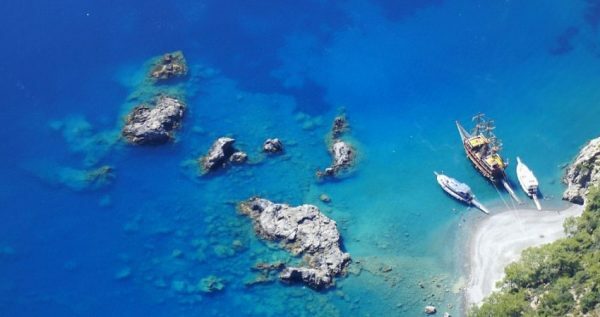 If you seek to spend your day in an endless and peaceful blue, Fethiye Boat Trip is the right one for you. 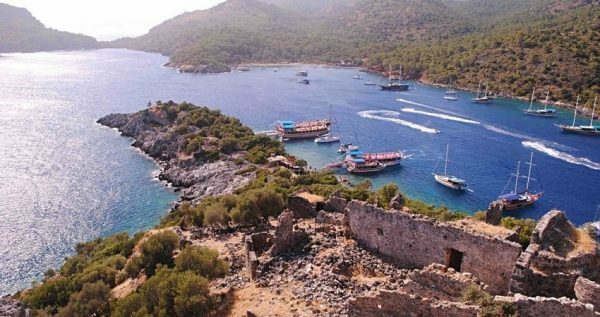 During the day, we will set sail for different bays and beaches, and you will enjoy the bright summer sun above and crystal clear water below. The warm summer breeze will take your soul away, and it will be a chance for you to escape from the stressful city life. 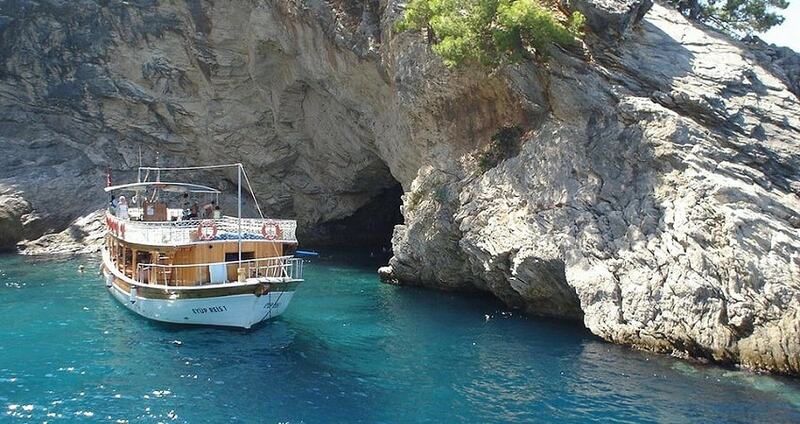 Fethiye Boat Trip will start in the early hours of the morning. During the voyage, you will witness how amazingly the emerald-green coastline welcomes the crystal clear waters. It is a trip that you can enjoy alone, or with your friends and family. During the day, we will visit 5 or 6 different bays and beaches, and a couple of them are remote places that can be visited only by boats. 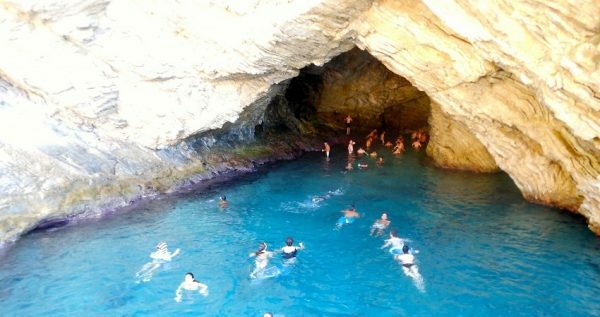 Our first destination will be Blue Cave. 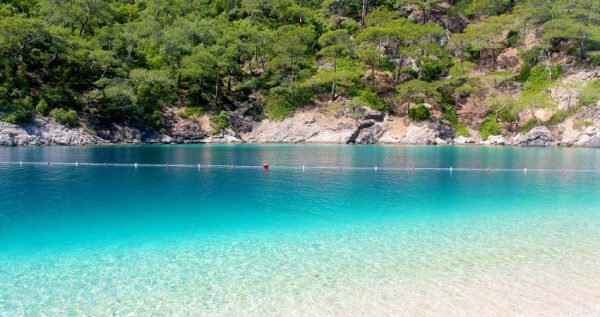 As you can understand its name, the topaz-blue clear water gives its name to the location. You can see sea surface easily, when you look down below. 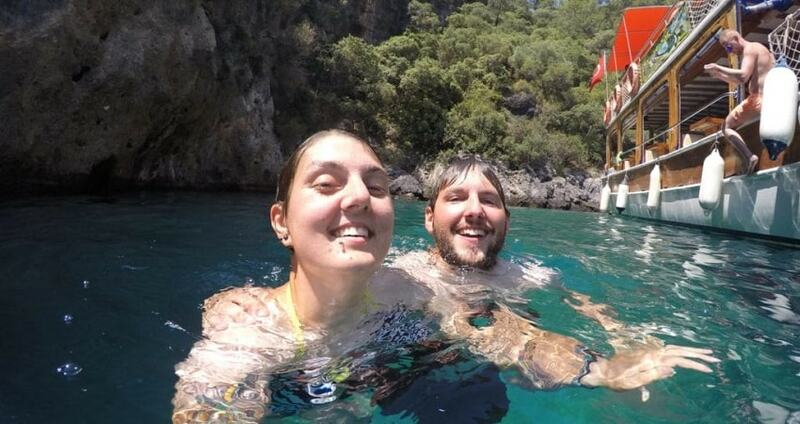 After swimming for a while in there, we will set sail for the Butterfly Valley. 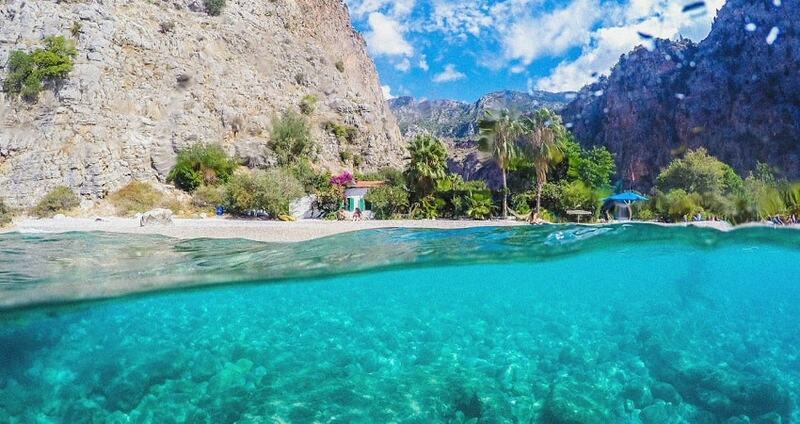 Butterfly Valley is an amazing spot in Fethiye, and it is home to a variety of butterfly species. If you are lucky, you can see many of them. If you are really lucky, you can even take a picture of them. This small and sacred place will welcome you with a peaceful environment. 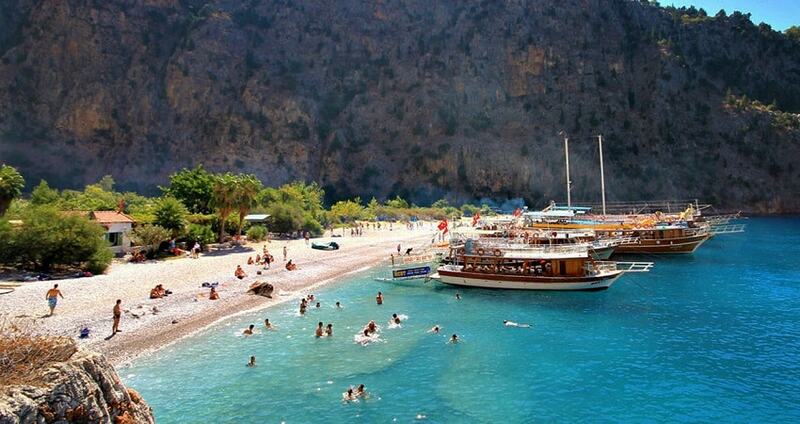 You can enjoy this escapade while swimming or you can have a coffee and relax in small cafes in the Butterfly Valley. At this point, a delicious lunch will be waiting for you when you return to our boat, while heading for our next stop; the Aquarium Bay. As you can understand from its name, this place is a real-life aquarium. If you give them food, the fishes will swim with you. They come so close that you can even touch them. 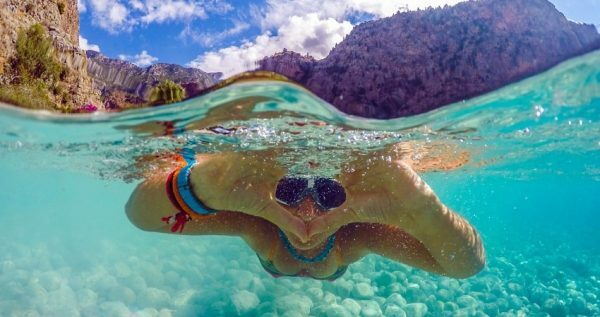 The crystal clear and transparent waters allow you to see through, it will be an unforgettable experience for you. You will definitely feel like a mermaid. St. Nicholas Island is our stop after the Aquarium Bay. This small island was once a home to Santa Claus, everyone knows him here. It is believed that he came from the snowy North, and spent his life here. Deve Beach, which we will visit after St. Nicholas Island is a unique place here, as you will see real camels here. You can take photos with them, you can pet them, and if you are courageous, you can even ride them. 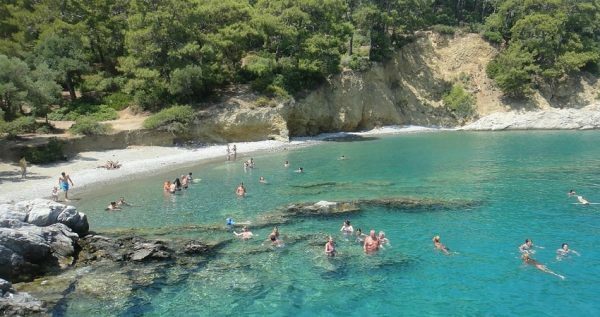 The shallow waters are very warm here, you can also enjoy swimming. If you need a break, you can also enjoy a cup of coffee in the small cafes here. After Deve Beach, we will set sail for Soguksu Bay. In this bay, you will enjoy the cool waters as the water here comes through the rocks. It will be a good opportunity to catch in hot summer days. Fethiye Boat Trip is a good way to spend your day in Fethiye. During the day, you will be together with green and blue, and witness how mother nature makes things in a great way. You will never forget this amazing day. As you will leave from our boat so pleased that, you will be smiling when you remember this experience in future. If you like to spend a day full of fun, Waterpark From Fethiye will promise you this opportunity. Our buses and drivers will be waiting in front of your hotels on the Fethiye Boat Trip day. They will take you to the port where our boat is anchored. Our boat is a traditional Turkish Wooden Gulet, and it is double checked before sailing. In our boat, everything is prepared and thought beforehand to give you a safe and sound journey. Everything will be ready to ensure that you are comfortable. Our guides will inform you about what to do and what not to do in the boat before getting in. Blue Cave is an amazing location that green becomes one with blue. As it is our first destination, we will start the day here. You will see many shades of blue in the waters here. After Blue Cave, we will set sail for the Butterfly Valley, which is a home to a variety of butterfly species. It is a peaceful place, and waits to be discovered by you. After you climb back to our boat before sailing for the Aquarium Bay, a delicious lunch will be waiting for you on board. It will be freshly-made, and will make you happy after long hours of swimming. While you are enjoying your lunch, we will be sailing for the Aquarium Bay. In this amazing place, you will have the chance of swimming together with a variety of fish species. They will come very close to you, and they will make you feel like a real mermaid! St. Nicholas Island is known as the home of Santa Claus, who came from the cold North and spent his life here. Witnessing a legend will be an unforgettable experience for you. In Camel Beach, you will see real camels, and if you are brave enough, you can even ride them. If you do not feel adventrous, you can enjoy the warm and shallow waters of this beach. Afterwards, we will head for Soguksu Bay. After relaxing at the warm waters of the Camel Beach, you will refreshen up in the cold waters of Soguksu Bay, as the water here comes through rocks. After completing our tour at Soguksu Bay, we will set sail for our starting point. Our drivers and buses will be waiting for you at the port we left you in the morning, to take you back to your hotels. During your journey, please feel free to inform our drivers and guides, if you need anything.